"Children are often envied for their supposed imaginations, but the truth is that adults imagine things far more often than children do. Most adults...wander the world deliberately blind, living only inside their heads, in their fantasies, in their memories and worries, oblivious to the present, only aware of the past or future...Imagination can be a beautiful thing, but it's also a trap. The wisest people are those who use their imaginations when they are children, and then learn to see the actual as adults." 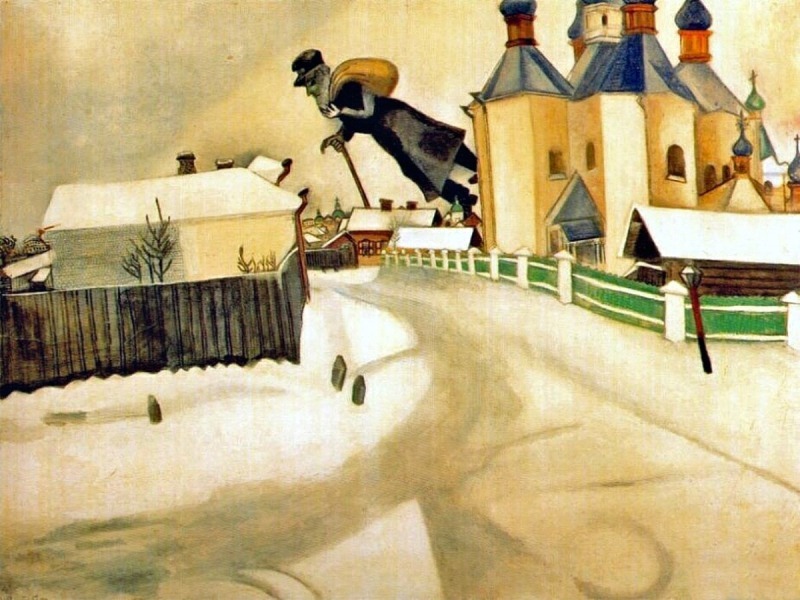 Over Vitebsk, Marc Chagall, 1915, oil on canvas. "It is a great injustice that those who die are often people we know, while those who are born are people we don't know at all. We name children after the dead in the dim hope that they will resemble them, pretending to blunt the loss of the person we knew while struggling to make the person we don't know into less of a stranger. It's compelling, this idea that the new person is so tightly bound to the old, but most of us are afraid to believe it. But what if we are right? Not that the new person is the reincarnation of the old, but rather, more subtly, that they know each other, that the already-weres and the not-yets of our world, the mortals and the natals, are bound together somewhere just past where we can see, in a knot of eternal life."